Art of Fighting (龍虎の拳, Ryūko no Ken, lit. "Fist of Dragon and Tiger") is a video game trilogy in the genre of competitive fighting game titles that were released for the Neo Geo platform in the early 1990s. It was the second fighting game franchise created by SNK, following the Fatal Fury series and is set in the same fictional universe as a prequel to the Fatal Fury series. 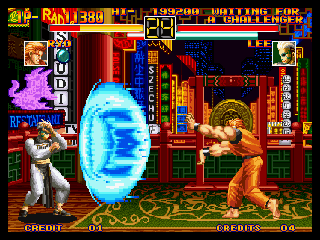 The original Art of Fighting was released in 1992, followed by two sequels: Art of Fighting 2 (龍虎の拳2, Ryūko no Ken 2) in 1994 and Art of Fighting 3: The Path of the Warrior (ART OF FIGHTING 龍虎の拳 外伝, Art of Fighting: Ryūko no Ken Gaiden) in 1996.